Work groups and teams make collective decisions. Jury’s reach verdicts. Executive teams choose strategies. Creative teams at ad agencies settle on a campaign they’ll recommend. Task forces and panels publish their findings. On their way to collective decisions and agreements, groups generate ideas, exchange information and opinions, synthesize data and eventually reach conclusions. Anyone who has ever served on a work team or facilitated a work team’s deliberations understands that it’s a messy, unpredictable process blessed and burdened by the vagaries of human interaction and social systems dynamics. People who study how group members process information together generally focus on one of two broad research areas: the study of how groups generate and exchange ideas and the study of how groups reach agreements and make decisions. Think about the last meeting you attended. There were probably presentations or, perhaps, some brainstorming followed by discussion. At some point in the meeting, discussion or information sharing ended and the group, formally or informally, chose what information or ideas would lead to action and what actions should be taken. For simplicity sake, let’s use the term, “diverging” to describe times when group members engage in idea generation, information exchange, and opinion sharing. Let’s use the term, “converging” to describe times when group members engage in culling or synthesizing information, discarding ideas, and reaching conclusions. For example, the recent controversy about the effectiveness of traditional approaches to brainstorming is an example of research about divergence. The classic “Groupthink” studies of team cohesion leading to policy fiascoes, like the Bay of Pigs Invasion, represent convergence research. While it’s important to help teams become more effective at diverging and converging, for me, the more interesting aspect of group information processing has to do with what happens as teams navigate the largely uncharted territory marking the transition from episodes of diverging to episodes of converging. What’s going on with a group at the point in their deliberation when additional information, ideas, and opinions stop being influential? What are the characteristics of the moment when the group pivots from being influenced by interactive exchanges to shutting itself off from consideration of additional information? As organizational systems scholars, how can we help groups recognize when it’s time to shift from diverging to converging and what are the implications of mismanaging or mistiming the transition from diverging to converging? I use the term, “inflection point” to describe the moment of transition in team information processing from diverging to converging. 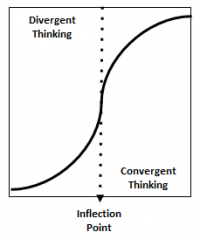 According to Merriam-Webster’s online dictionary, an inflection point is “a point on a curve that separates an arc concave upward from one concave downward, and vice versa.” Think of the concave upward portion of the curve and the space above it as representing an episode of divergent thinking during team interactions when information is being added; when the group is open to generating and considering additional data and perspectives. In the same way, the concave downward portion of the curve and the space below it represent episodes of convergent thinking during team interaction when information is being assessed and culled, when team knowledge becomes fixed and new information, even if it is shared, is not influential. An inflection point in team deliberation marks a shift in the collective openness to additional information and perspective. The earlier a team reaches an inflection point, the earlier the nature of the interaction changes from information seeking to information culling. Consider, for example, a jury deliberation. An interaction episode that starts with each jury member stating his or her conclusion about the guilt of the accused and concludes with someone proposing a collective verdict represents a relatively quick move through an inflection point. Reach an inflection point too early and the team risks missing something important. Reach an inflection point too late and the team risks drawn-out exchanges that add no value to the team’s deliberation. Clearly, not all individual members of a group will shift their thinking from divergent to convergent at the same time. The inflection point may be wide or narrow depending upon how long it takes the collective to shift; consider the jury deliberation in 1957’s Twelve Angry Men, a classic movie depicting a lone juror slowly influencing eleven others who had initially reached a different verdict. When teams deliberate effectively they bring out the best in each individual team member while making productive use of the diverse perspectives and available expertise. When teams deliberate ineffectively, they run the risk of missing something important, reaching poor quality conclusions, or damaging rapport among team members. Since organizations increasingly rely on work teams to set direction or accomplish critical tasks, organizational effectiveness depends to a significant degree on the quality of the outcomes teams produce and how people feel about work has more and more to do with how they feel about their teams.